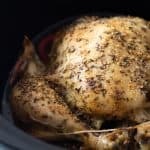 This Crock Pot Whole Chicken recipe creates a flavourful, rotisserie-style chicken dinner, right in your slow cooker. 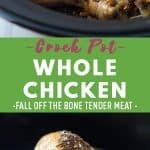 The chicken is so moist and juicy, it will literally fall off the bone! What can you make with a slow cooker whole chicken? sandwiches and sliders – Toss the chicken in some barbecue sauce to make BBQ shredded chicken sandwiches. Yum! 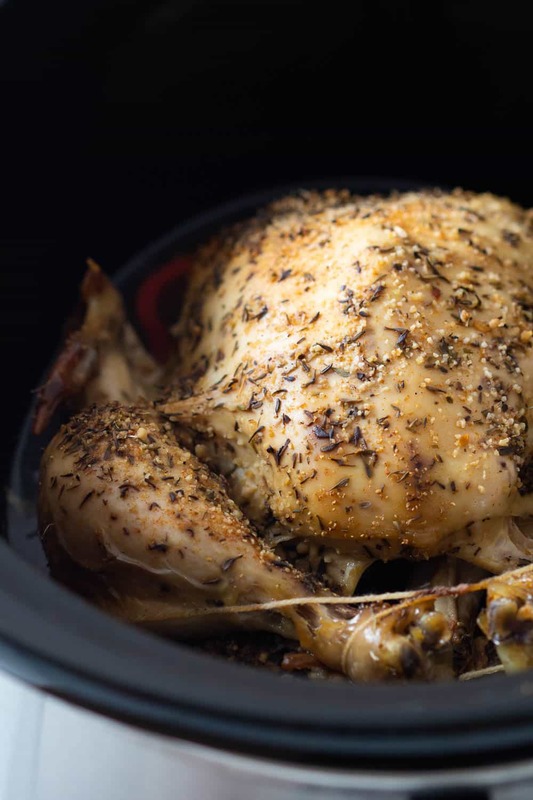 Of course, you can simply enjoy slow cooker whole chicken as is, too; everyone loves juicy roasted chicken! When I serve whole chicken, I include sides like potatoes and carrots, bacon wrapped green beans, and dinner rolls. Oh, and don’t forget to serve the rolls with homemade garlic herb butter. How long does it take to cook chicken in the crock pot? Making crock pot whole chicken can take a bit longer than it does for smaller pieces like chicken breast. Because you don’t want the meat to dry out, it’s important to cook it on low heat. It’s all hands-off cooking time though, so it is very simple to do. On low power, it takes about 8 hours for a whole chicken to cook. Is trussing a chicken necessary? 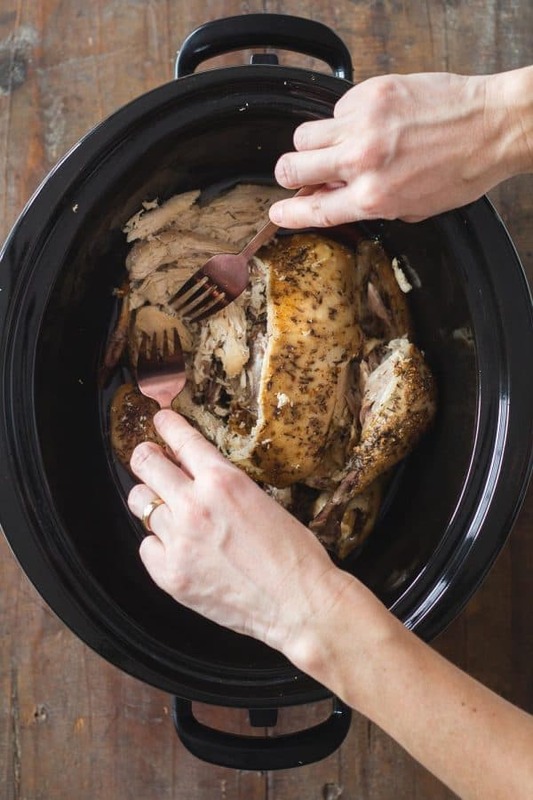 Whether I’m making a crock pot whole chicken or roasting it in an oven, I truss the bird. Trussing is a method that involves using twine to tie the chicken into a tight package. This closes the cavity of the bird, preventing hot air from circulating inside. That hot air will dry out the breast meat before the rest of the bird has a chance to finish cooking. While you don’t have to truss a chicken, I recommend doing so because juicy chicken breast is the ultimate goal! If you don’t know how to truss a chicken, there are many helpful step-by-step photo tutorials and videos available online. I think Alton Brown’s video tutorial on trussing a chicken is perfect. Do you cook whole chicken breast side up or down? In the history of roasting a chicken (or any other poultry), no question comes up more than this one. 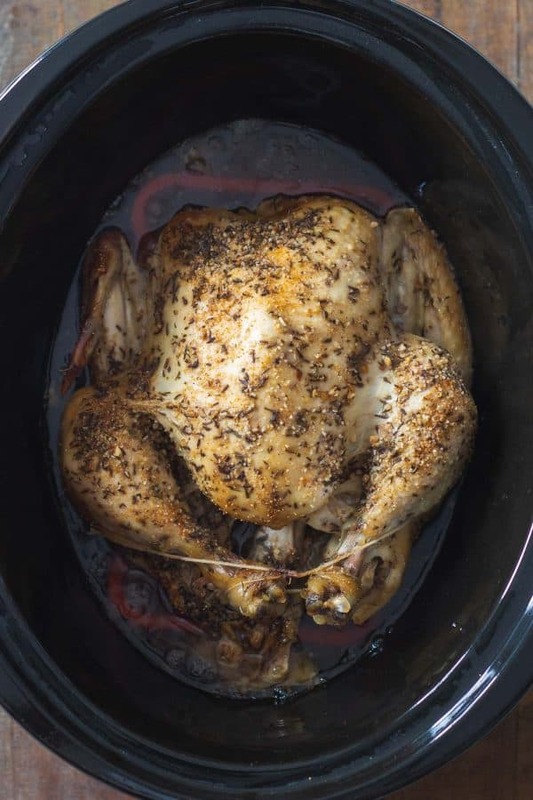 For this slow cooker whole chicken recipe, the chicken is cooked breast side up. Some people believe that cooking a whole chicken with the breast side down will keep the breast meat from drying out. If you prefer to cook it that way, feel free to do so. Either way, the chicken will end up delicious! Pat dry chicken really really really well with a paper towel. 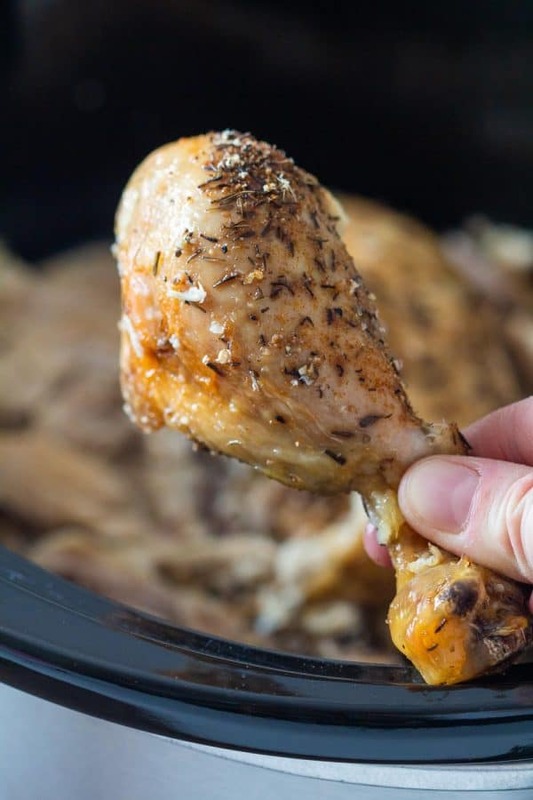 Add silicone rack to the bottom of your crock pot, place chicken over the slow cooker and season the back of the chicken so whatever seasoning falls off, falls into the crockpot. Place chicken back side down onto silicone rack, then season the top part (breasts and legs). Add 1/2 cup chicken broth to the bottom of the crock pot without wetting the chicken. Place lid on the slow cooker and set to 8 hours on low. This chicken cooks best on low and a minimum of 8 hours only. On high, the skin won't become nice and brown and the meat will dry out a lot. I recommend removing the skin, shredding the chicken and mixing it with the drippings. For a nice gravy-like consistency you may want to transfer the dripping to a pan and bring to a boil and reduce.